Many homeowners treat their attics like a storage space. Boxes and broken furniture fill every corner and the entire space looks like a dusty crammed mess. Although supposedly blocked off from the rest of your home, the state of your attic can have a direct impact on your living conditions. Proper attic insulation can reduce your heating costs in the winter and cooling costs in the summer. It can also keep noise pollution from the outside to a minimum. Upgrading your attic insulation can be complex, but we have an experienced team that can professionally handle every aspect of the process, from removing the old insulation to installing new materials. Not to worry, our attic services don't end there. Investing in the replacement of old or inadequate insulation is only a partial solution. Many older homes have gaps and leaks in their roofs due to poor sealing of the space. This allows hot air to escape, driving up heating costs and potentially causing water leaks. There's also a real risk of mold or bacterial growth. Proper air sealing can improve energy efficiency and maintain the structural integrity of your roof and attic space. Small leaks and various types of animal infestations can result in a messy, disgusting or even dangerous attic space. If you've got a build-up of animal droppings on the floor, our team can make your attic safe and sanitary again. Using specialized equipment, we'll first clean all the major debris and remove any occupying pests before decontaminating the entire area. Don't let damage or filth prevent you from using this space or allow it to reduce your overall home value! Investing in professional attic cleaning and decontamination service can help protect your home. 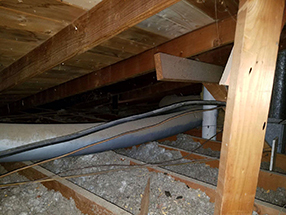 Residential buildings aren't the only ones that experience issues with attics or crawl spaces. At Air Duct Cleaning Milpitas, we offer comprehensive attic services for both residential and commercial buildings. If you need commercial services or improved insulation in your home attic, call us today!